Sandy Benitez writes poetry and short fiction. She is the founding editor of Flutter Press and Poppy Road Review. Her previous poetry micro-chapbook, The Lilac City, was published by Origami Poems Project. She’s been published in over 140 print and online literary journals since 2006 and has been nominated for Best of the Net and the Pushcart. Sandy has also authored five poetry chapbooks and has been published in five anthologies. She’s always been intrigued by the paranormal, forests, gardens, and abandoned buildings. Sandy currently resides in Southern California with her husband and two children. Cherry Blossom Days, by Sandy Benitez, is a collection of lyrical love poems; a love story that unfolds within the season of Spring infused with memories of the Pacific Northwest and Asian imagery. Cherry Blossom Days is a beautiful love story written in soft, lyrical poems that do not fail to touch hearts even after many readings. The journey of love has been documented through the use of imagery of nature. The theme of seasons and plants in various stages of their growth runs through the entire book. The poems talk of love being born, the difficulties that the couple goes through together, of waiting and meeting, and of the insecurities that, at times, live in the hearts of lovers. The lovely scenes created by the poet make them come alive in our minds and leaves the reader with a sense of gentle contentment. Cherry Blossom Days has both short and slightly longer love poems interspersed by Haikus. The tone of the book is conversational, and the poems lyrical. At a couple of places, I felt that the poems have been broken into paragraphs that serve no purpose greater than structure, but the book, otherwise, is almost perfect in its content and presentation. An easy read, with gentle and loving poetry, the book has a very Asian feel to it in its imagery, but the emotions woven through it are timeless and pure. I would recommend this for a short, feel-good, weekend read that would surely bring a smile to your lips. J. Andrew Schrecker was born in Owensboro, Kentucky. He is the author of Post-Millennium Rhapsody and Insomniacs, We. Insomniacs compose grocery lists and manifestos, a phoenix lies charred in its own ashes, and shadows hide in corners, afraid of themselves. In this decade-spanning volume of poetry, J. Andrew Schrecker blends surrealism, observation, and personal confession to paint a portrait of heartache and longing in recession-torn America. “Insomniacs, we” by J. Andrew Schrecker is a book of poems written between 2005 and 2017, and in the words of the author, meant for the restless generation. Very relatable poetry whose tone perfectly complements the words is the USP of “Insomniacs, We”. The title of the book is very intriguing. The beautiful epigraph, which incidentally has quotes that I love, and the very interesting poem titles in the Table of Contents got me reading eagerly. The opening poem, very aptly titled “Insomniacs, We” is a great introduction to the insomniacs, the creators who look at the world with a different set of eyes than everyman. I love the general tone of the book which is just right for the content. The poems are not rhymed or have a traditional poetic structure. They are more paragraphs of thought, but they work very well for this collection. The stark contrast depicted by Schrecker in the poem “Everything” shows his mastery over words. There is something strangely gripping in the turmoil depicted by the poet. Many of the thoughts are not happy but never depressing, almost carrying a matter-of-fact acceptance that is at once troubling and alluring. The book is full of stories in grey…not light, yet not touching darkness. Though for me the cover was not too inviting, the book itself turned out to be a very absorbing read. I would certainly love to read his other poetry collection as well. Derrick was born in Huntsville, AL. In 1992, he joined the United States Navy. During his 20 year career, he served with the Marines and the Seabees. He’s also been deployed to the Mediterranean, Japan, and Afghanistan. In August 2014, he graduated from Grantham University with his Bachelor of Science Degree in Business Administration. In September 2016, he graduated from Grantham University with his Business Leadership Certificate. In October 2016, his first poetry collection was published entitled Heartfelt Moments: Treasures of the Heart. This book was written to help veterans and their families develop possible coping mechanisms for handling an array of problematic issues. It also has a message for everyone even if they didn’t have an affiliation with the military. Derrick currently resides in Huntsville, AL with his wife Felesha. I am strong and liberated and difficult to understand. I am determined in my agenda no different than a man. If I see something I want, I’ll watch then I’ll see if he is definitely the man that’s perfect for me. Derrick Graham’s A Woman’s Story takes the reader on a journey of love, confusion, motivation, and tearful moments. Each climatic experience reveals a message that strives for stability in life and relationships. Although it is spoken through his words, it illustrates it’s not easy being a woman. A Woman’s Story (Her Prerogative Spoken Through His Words) By Derrick Graham is a journey through the life and heart of a woman at various points in her life as she sometimes smiles and sometimes struggles to make sense of the world and her situation in it. The poems are written in the first person by the woman (in whose voice Derrick Graham is speaking) The book, that is almost like a diary of a woman, is a good mix of poems of gravity, and those in a lighter vein. Some talk of incidents, some of feelings and others of her own shortcomings, as she sees them. What stands out is the poetic introduction and ending to the book where the poet speaks to the reader in a poem. The poetry here spills the words hidden in the heart of a woman, as a man sees it, and that makes them different from the other books where the man or the woman is speaking for himself or herself. I Return the Favor is a particularly touching piece for its feelings. If you are looking for poetry with a simplicity of language, an inspiring, conversational tone and feelings that many women will identify with, read this very nicely put-together collection from Derrick Graham. Mark Kloss is a London born business and family man, who has always had the innermost dream of writing and having others enjoy his stories. After his son’s huge success in the self-publishing game, he thought he better step it up a few gears and get his work out to the public. Now published are ‘Game Hunter,’ and its sequel ‘Showtime,’ a young adult novel set in a dystopian zombie future. ‘It’s a Funny Thing Life,’ a poetry book of love, loss and inspiration and ‘Rioting Against the Odds,’ a poetry book of adventure and fantasy. Once again, in Moon Dreams, Mark’s soulful and uplifting poems have given perfect rhythm to the love, adventure and trials of the life we share. Like Mark’s previous book, It’s A Funny Thing, Life, each poem is easy to read and a joy to follow. From the fishermen’s battle with nature’s raging sea, to the dark rider’s race through the forest to save his true love, his beautiful words reach into our hearts, as they first reached into his. Most were written after the day had finished its watch, some into the late hours of night when the pace of life had slowed. And so, he offers you his latest set of poems to help you dream, if just a for a short while, of other lives and times, with the help of the moon’s friendly eye. As the name suggests, Moon Dreams is a book set mostly in the last part of the day and the poet wishes to create a setting where you can dream under the mellow light of the moon. The simplicity and honesty of the emotions portrayed give the book its appeal. The book opens onto beautiful word-images that Mark has created. Every poem is a wonderful story, the words are expressive, the rhyme perfect and the pictures created take the reader to the scene in an instant. Draws in its yellow heat. Are full, ripe and sweet. “Steady there,” the rider hissed. These lines are just a beginning and an example of the poet’s exceptional skill with words. The poetry is complemented with equally fabulous sketches that add to the charm of the book. I could point out a lot more, but I don’t want to paste his whole book here. E. P. Mattson is a native Californian poet and multi-disciplinary artist. His work is keenly concerned with inner transformation, the supreme authority of the individual over the collective, and the profound healing power of the arts and the natural world. In his professional life, he’s worked as an artist on everything from theatrical plays, to video games, to blockbuster Hollywood films. But after many years of collaboration, he is now focusing on his personal artistic works, following the white rabbit of the spirit during these astounding times of transformation and upheaval. Currently, he’s at work on a book of travel poetry and photography, a collection of short plays, and the follow-up to the Opulence Of Invention. This is his debut work as a poet. A sprawling work of poetry and original illustrations roaming the landscapes of the mythic and the surreal. At times lyrical and darkly humorous with a sharp satirical edge, celebrating the human experience, the avant-garde and the beauty of the natural world. Featuring 13 dreamlike line drawings created in pen and ink. Poems range from odes to rainforests, rock stars and robber barons, to elegies of loved ones passed, cinematic dreams and surrealist fantasies, reflections and realizations. In the spirit of the iconoclast, E. P. lampoons mass conformity, war profiteering and media manipulation while amplifying that lone voice in the wilderness, the cry of the Individual who has been pushed far out into the wild perimeters of civilization. And throughout the book, there is a love of freedom, imagination, and the communal alchemy of sharing bold truths with fellow souls around a literary campfire. True to its name, the book The Opulence Of Invention is a grand sprawling work of art. There is something about the tone used by the poet that evokes the feeling of magnificence and the fantastic. The opening poem sets the book straight on to its chosen path by the words of the poet. The style of the poetry in this book is sharp, even a little edgy, the choice of words and the short sentences are apt for what the poet wants to convey. The poems have a lot of repeated sounds and rhymes are strong and powerful. What stands out are the pen and ink drawings, the first one that we encounter at the beginning of the book draws the reader in, and all the rest don’t disappoint either. The poet has used shape poetry to great effect and the placement of the words on the page enhance the reading experience. The words Run Outside, and the guitar shape, are just two examples, a teaser, meant to churn up an appetite for more, that is well satisfied as the book progresses. By no means a bedtime read, this book, a beautiful amalgam of poetry and prose, needs the reader to be alert and engaged on various levels to be able to fully enjoy the poet’s creativity. I took a long while reading it, slowly degusting the pages, and I am very impressed by the creativity and effort put in by Mr Mattson. A great read for all poetry lovers! Although Arthur Turfa has travelled to many places, his writings contain images of Western Pennsylvania and the people he knew growing up. Perhaps that explains his interest in languages, people, and various places. He has lived elsewhere in Pennsylvania, as well as California, Virginia, New Mexico, Germany, and now South Carolina. Each of these, as well as from his travels, has influenced his poetry. Through his careers as pastor, educator, and Army chaplain, he has come into contact with people from nearly every walk of life. In 2015 his first book of poetry, Places and Times, came out from eLectio Publishing. Turfa has also been published in print and 0n-line journals nationally and internationally. He has retired from some things, but not all. Currently the Midlands of South Carolina are home to him and his family. Saluda Reflections is a book of poetry that covers the scope of the poet’s career and some deal with earlier events and themes. A few of them deal with some contemporary issues. All of them found expression in the woods of Saluda County, South Carolina. Saluda Reflections, as the name suggests, is a book of poetry that has been written in the woods of Saluda County, South Carolina. It takes us on a poetic journey into Saluda as the place comes alive under the pen of Arthur Turfa. The poems paint beautiful word pictures of not only the physical features but also of the times, taking the readers into beautiful woods, faded old towns, mountains, bridges and the minds of the people as the various events unfold. “Wyoming Valley, Pennsylvania” is a beautiful depiction of a fading coal town and how it touches the lives of those who came to work here. Another poem I enjoyed reading was “Reflection on Musgrove Mill and Today” with its battles in green meadows moving into cyberspace and chatrooms. “The Twelve Bridges Road” is my favourite, because of the beautiful metaphors and symbols used by the poet. the road only goes so far. Before e’en’s last dark hour goes by. Softly, my sweet, take I my leave of thee. The poetry doesn’t have much rhyme, as we traditionally might expect, but that is more than adequately made up by the story like quality of the book, that takes us step by step through the evolving landscape and society. The poet’s voice is gentle and soothing, and the tone is maintained throughout the book. Though at times, one might wish for a stronger poem, it is to be remembered that this is a book of reflections, and probably, the poet wants us to ponder along rather than react to things. If you are too far away to visit the Saluda county, I suggest that you take this journey with Arthur Turfa, step back into the recent past and enjoy the beauty this place has to offer for the eye and the soul. Isbelle Razors (real name: George Papadimitriou) comes from Athens, Greece. He writes poems and music, sings and plays the piano and studies Business Administration. He speaks Greek, English, French and Spanish. 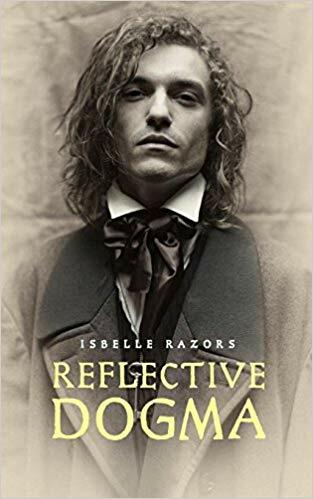 Isbelle has lived all over Greece, in Valencia, Spain, in Quantico, Virginia, in Cyprus and is also a model, an ex-narcissist (well…), a Second Lieutenant reserve of the Greek Special Forces (Airborne), a Pirate and an eternal seeker of truth and lover of beauty. I was a little apprehensive about the book, perhaps the title did not call out to me, but the book itself turned out to be a near perfect package. A gripping narrative, right from descriptions to set up, and the suggestive words “END?” and “NOT THE END”, it speaks of the poet’s talent. And when one considers the fact that most of it has been written by a sixteen-year-old… well, I would certainly love to watch him grow even further! We must hurry before the curtain falls. We are the actors. My only fear is time… the acidic taste of leaving my life’s puzzle incomplete. Very lyrical and rhythmic in parts, the book is a complete story, yet every poem can stand alone by itself as well. I found that at times the poems begin to meander in the middle, but on the whole, they are compact, refined and thought-provoking. This is not the kind of poetry one would be indifferent about. There’s no middle path here, either you would like it, or you won’t. It is different. The theme and the treatment is his very own, and I liked it immensely. Certainly worth a read, or two! Lorna Jackie Wilson was born on April 11, 1964, in Detroit, Michigan to Carrie Jean Wilson. Lorna has lived in Michigan most of her life, outside of U.S. Army, military enlistment. At the age of four, Lorna was placed in foster care. At the age of 10, she was reunited with her mother and siblings, only to be separated and returned to foster care at the age of 13. Lorna’s journey and related circumstances surrounding foster care placement presented situational experiences that no one should ever have to face. Feeling lost and abandoned, Lorna began to write. Initially, the harsh realities of life spilled into her journals. However, the journals became a testimony to others, illustrating the life of an overcomer. In Lorna’s last and final foster care home, she was placed with Acie Lee Spraddling. Acie Lee Spraddling was the catalyst toward positive change. She was a true advocate for youth, adopting 11 children and taking in 17 foster care children. As a parent, Acie led by example and truly cared for children. She introduced Lorna to Christ and took her to church at nearly every opportunity. Needless to say, Lorna’s journals began to embody faith and hope. Acie made her heavenly transition on July 21, 2015. Her legacy lives on through her children. Lorna’s journey continues as she gives back by speaking to youth about foster care experiences and overcoming obstacles. She has four beautiful children who support her writing and encourage its continuance. She holds a bachelor’s degree in business administration and master’s degrees in business education and information technology. In 2013, Lorna entered a national singing competition/fundraiser, sponsored by William Beaumont Hospital. The fundraiser was launched to support Children’s Miracle Network. Lorna was one of the twelve finalists in the competition. 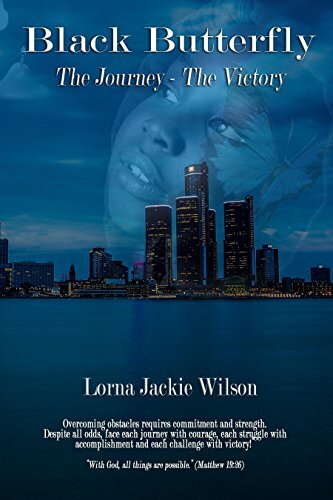 In addition to Black Butterfly: The Journey, The Victory, Lorna Jackie Wilson is the author of Babygirl: Prequel to Black Butterfly, Game Changers: Power – Control – Deception, and Penny Candy: The Hopscotch Trails. Black Butterfly is a compilation of poetry that speaks to the silence of loss, the fight for families, and love for foster children. With consideration to the daily realities that foster children or youth may experience, Black Butterfly embodies real-life issues through faith-based reflections. This is a young girl’s journey, pre and post, foster care. This compilation is dedicated to the foster child, the youth in crisis, and individuals striving to achieve positive change. Black Butterfly proclaims wholeness to the fatherless, healing to the broken, and hope when faith and determination are all that remain! THIS IS THE JOURNEY – THE VICTORY! Black Butterfly: The Journey – The Victory is all about the journey of broken hearts from tragedy to victory through faith. The poet has drawn extensively from experiences of her own life, and the word pictures she has created are very touching. The book opens with the poem A Child Misplaced, an account of the feelings and questions that looms in the minds of children who find it difficult to understand “why them!” There are several poems that deal with the problems of teens and young adults, about God and Christianity, and about women. There is also a whole section of poems that are tributes to the people who have meant a lot to the poet. What stands out in this book that talks a lot about troubles and brokenness is the hope that shines through almost every poem. It is admirable that the poet herself has not given in to despair even in her own life and is a role model for many who find themselves in a difficult situation. The theme of Christianity is very strong in the book. Those of another faith might not find some of the poems very appealing, but personally, even though I am not a Christian, I had no problem with that. I felt that the poems are universal, if we mentally tune out of the name of Jesus, and substitute it with a universal God, they are something we can all relate to. Some poems that spoke to me were “Come let us talk”, “Teen life in the hood” and “The beauty within”. “Before you enter heaven” is one that I do not agree with, but this is my personal opinion and not a commentary on the poem itself. The poems themselves are very lyrical, however, they have a very similar structure and at times one begins to wish for more variety in style. Overall, the book is very well written, I especially liked the introductory pages and the tributes. For a reader who has no issues with Christianity as a theme, the book is one that makes you think and helps produce a positive change with hope and faith. Born in Indonesia, Joannes Rhino was educated at the local state school until graduation in 1998 and continued to study in Hospitality University. Having no literature experiences whatsoever, he managed to publish his first novel “Etzhara” by the biggest traditional publisher in Indonesia and took him as one of the best young writers under thirty at Khatulistiwa Literary Award in 2009. His second psychological novel “Dream”, however, was the one that made him an overnight success. He then began to receive many invitations to attend book signings, talk shows, radio interviews and other literary activities. His Amazon Best Seller in suspense fiction, “The Unseen Face”, brought him to be an international author. He is now working full-time as an Editor, while at the same time doing freelance projects as a Ghostwriter and Scriptwriter. In As The Rest Heal My Heart, Joannes Rhino bares his soul for us again…this time emerging as a survivor. Rhino demonstrates the power of strength, healing, and love amidst the debilitating sorrow of loss. He teaches us that we matter, we are loved, and we deserve a second chance to create a fulfilling and happy life. 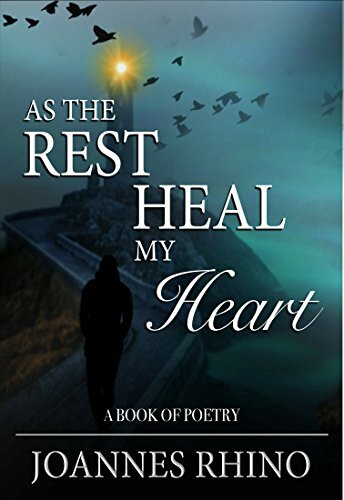 “As The Rest Heal My Heart” by Joannes Rhino is a book of poetry that speaks of the sadness and torment of the soul and how the soul tries to fight what threatens to bring it down. Inspite of the sad theme, the tone of the poems is insistent and upbeat, in keeping with how the soul still believes in the healing power of love. The rhythm is easy on the mind, the words lyrical and meanings deep. The use of font interestingly enhances the theme, specially in the first half of the book. The reader comes out in the end with hope in the heart and a desire to rise above the travails of life.